The Bison Bede 50 stairlift. Retaining all the characteristics of the original Compact that made it one of the worlds best selling straight stairlifts, the Bison 50 was designed to deliver even swifter cleaner installations, and greater reliability and operation. The Bison 50 provided an even smoother and comfortable ride quality with a built in soft start and stop facility. The integral high power re-chargeable battery pack ensured the stairlift is always available for use even in the event of a mains power failure and removed the need for an external battery box. The slimline design of the Bison 50 ensured it would fit on even the narrowest of straight stairs, folding up to less then 12 inches (300mm) when not in use ensured maximum access to the staircase was available to non-stairlift users. The Bison 50 was designed to easily blend into your home and should have quickly become as much a part of your life as your favourite armchair. A choice of different seat heights were available, to maximise comfort. 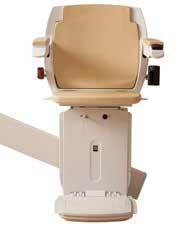 The Bison 50 also offered a choice of seatbelts to ensure safe travel on the stairlift, additional safety and peace of mind. The footrest of the Bison 50 was extremely close to the floor, and stopped level with the top step for easy access to the landing. Safety edges automatically stopped the lift if they sensed an obstruction whilst the stairlift was in motion. For people who had difficulty in bending, the optional powered footrest raiser effortlessly folded away when not in use. The Bison 50 was fitted with a Self Diagnostic Display on the carriage which indicated the status of the lift and service information. When it came to parking there was an optional Auto Parking facility which, at the press of a button, would automatically fold away any powered seats, footrest or hinges and park the stairlift on the rail. Every element of Bison 50 was designed to provide an even more comfortable ride and years of reliable use.